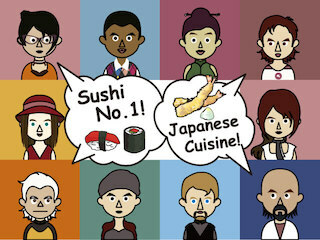 Tokyo Sushi Academy | WHY CHOOSE US-WHY SUSHI/JAPANESE CUISINE? 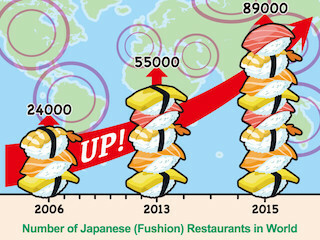 According to the survey conducted by Japan’s Ministry of Agriculture, Forestry and Fisheries, Japanese restaurants or Japanese fusion restaurants drastically increased their number from about 24,000 in 2006 to 55,000 in 2013 and 89,000 in 2015. Despite high demand in the world, today’s Japanese chefs tend to remain in a comfortable environment of their own country and thus Japanese-cuisine chefs are much needed in the world. 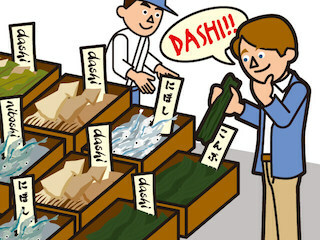 “Dashi” and “Umami,” the fundamental components of Japanese cuisine, are attracting attention from all over the world. Chefs of world-renowned restaurants visit Tokyo to learn Japanese cuisine. 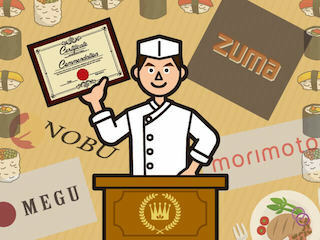 Japanese fusion restaurants, such as Nobu, Zuma, and Morimoto, have become a food trend in the world. Due to the development of distribution systems in the last decade, it became possible not only for high-class restaurants in Tokyo but anywhere in the world to have seafood directly transported from the Tsukiji fish market. As discerning customers increase, high-end Edo-style sushi restaurants proved successful in Hong Kong, New York and Singapore. Next: Why it is important to learn at TSA?